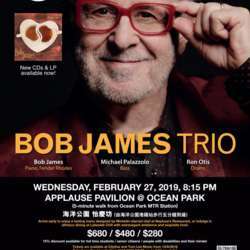 You must be a member of the Hong Kong Jazz in the Spot Group to attend this activity. Would you like to join this group? Robert McElhiney James (born December 25, Protected content an American Grammy Award-winning jazz keyboardist, arranger, and record producer. He founded the band Fourplay and wrote "Angela," the theme song for the TV show Taxi. He is most famous for standards such as "Nautilus", "Westchester Lady", "Heads", "Night Crawler", "Touchdown", "Blue Lick", "Sign Of the Times", "Spunky", "Marco Polo", "Courtship" and "Just One Thing". Music from his first seven albums has often been sampled and has contributed to the formation of hip hop.